”Me – thanks to my mom, I’ve got good legs. That’s about it. I’ve got your sagging buns, love handles, a thickening middle and stuff that seems to be oozing out around my back bra straps like rising bread. I try not to view photos of myself. Candid shots usually bring tears to my eyes. I suspect I feel a little like Brittney when she sees herself on the cover of the National Inquirer at the check out counter. But every now and then I see a photo that is pretty decent. I rarely pay retail, like to buy good clothes and seek them out off-season at 70% discounts. A good fabric makes a difference. So does color. I have a Mediterranean friend who can make yellow sparkle and an African American friend you is positively radiant in chartreuse. I can’t even go there. I’m more a jewel tone girl. My house, my wardrobe. even my file folder choices reflect my color preferences. But, fortunately, there is always black. I’m hoping you have either never heard or may have forgotten some great tips that were published a few years ago to help us all look our best. My friend Joni Barrett is a fashion consultant who sells for the Doncaster clothing line. She’s a marvel and the clothes are simply lovely. I try to splurge on at least one piece a year and I pay retail! Joni did a “closet intervention” on me last year and I will be forever grateful. I probably qualify as a clothes hoarder. She asked me questions like, “So when is the last time you wore that size six skirt you have been keeping for 20 years because it has a good label and was expensive?” I wept at the curb as I waved to the departing Goodwill truck. While in my closets.Joni would comment on clothing appropriate color and shapes. She taught me a simple tool to help me understand body shape. Go get a piece of string at least two feet in length. Place the end of the string at the very top of your shoulder and find your natural waist. Keeping a finger and thumb holding the place where the string hit your waist, drop the shoulder piece and place it at the point where your derriere meets your thigh (or as close as you can get). If the string is too short to reach the target, you are short-wasted. If it’s too long you are long-waisted and if it just reaches you are one of those lucky people that is perfectly proportioned. Shape matters in how we dress. Remember when people talked about the 36-24-36 body? 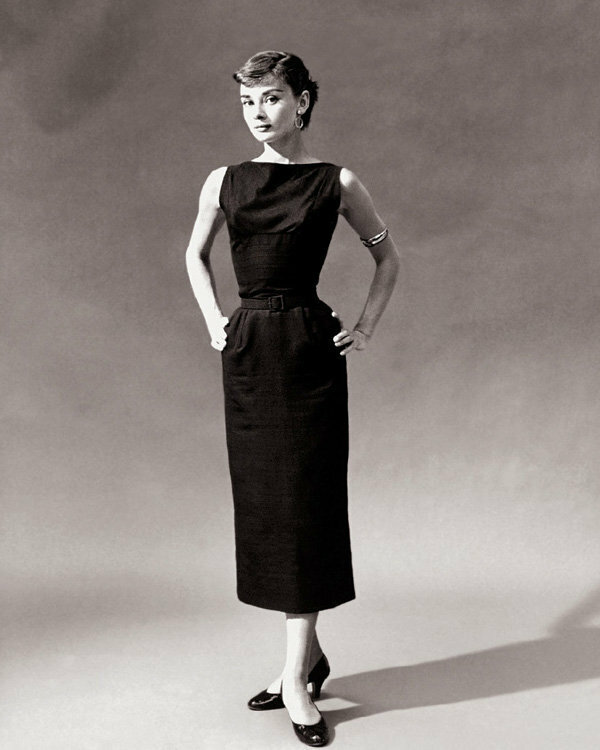 I looked at photos of old movie stars and I cannot believe those waistlines. The young Liz Taylor, Marilyn Monroe, even Rosemary Clooney. I even saw a trailer for Oprah last year where a guest had managed to maintain a 16” waistline by constricting it throughout her life. Back to reality, few of us have an hour glass shape. We more likely could be described as having other shapes like the ones that are described in Kristin Ketterinham’s 2008 Article Find the Perfect Dress for Your Body Shape: Apple, Pear, Rectangle, Hourglass, & Round. So how does she describe the shapes and how does she suggest we dress. o Don’t wear halter tops or dresses, heavy prints, boat necklines, puffy sleeves or anything with lots “going on at the top.” I personally think that spandex should be outlawed on anyone weighing more than 80 pounds but it is absolutely forbidden for Apple shapes as well as some others as we shall see. o Do wear V necks whenever possible. They take the eye away from the full bust and balance the shapes. Balance can also be achieved with an empire waist, full skirt, a strapless or plunging necklines (if you have it flaunt it). o Don’t wear clothing that is fitted on the bottom or that tends to draw attention to this area. A solid tank top with huge floral skirt or shorts is likely a poor choice. o Do’s: If this is your body type you want to take eyes away from the bottom and bring them up top. Go ahead and embellish. If you have a slender long neck, wear the fun jewelry and learn how to tie scarves. You may even want to buy that padded bra. The letter A is your guide. You may want to opt for crop pants over shorts and definitely buy the matching cover up for the swim suit, But, on the plus side, you may look fabulous in the corset-strapless Madonna ensemble. o Don’t do plain or baggy or shapeless. That sack look makes you look as though you’ve been on a hunger strike. Toss the sleeveless black sheath unless you have a huge belt and floral jacket in just your color. o Do make your own curves. Jewels about the neckline, big belts, puffy sleeves, full skirts all assist in creating the illusion of grand curves. Clingy fabrics don’t work here either. • Hourglass – that body type we all crave is the easiest to dress. You really don’t need any help as you look good in nearly everything. The only caution Kristin offers this group is to stay away from heavily beaded attire as they tend to make you look heavier. • Circle/Round or as we like to call it the Mushrooming Menopausal Midsection. To say that the waists on this body type are not well-defined is an understatement. This is where every extra pound lands. o For goodness sake do not wear spandex or anything clingy. And don’t try to just hide in black all the time. o Show a little skin. If you don’t have upper arm skin waddle, go sleeveless, V necks, empire waists, A-line cuts and sheaths work well here to re-define this body shape. Current fashion favors long tops some of which are elasticized at the hips. Try it on, it may work for you. Don’t wear cords, buy a down coat or wear heavy fabric and I don’t think I need to revisit that spandex ban. My last comment has to do with comfort. Buy a great bra, work on your posture (good posture hides 10 pounds), lower the heal a bit but stick with the cute shoes and compensate for your flaws. I have the torso of someone 5’11” and the legs of a midget. Maybe I can find someone really short-waisted with long legs and we could just swap.